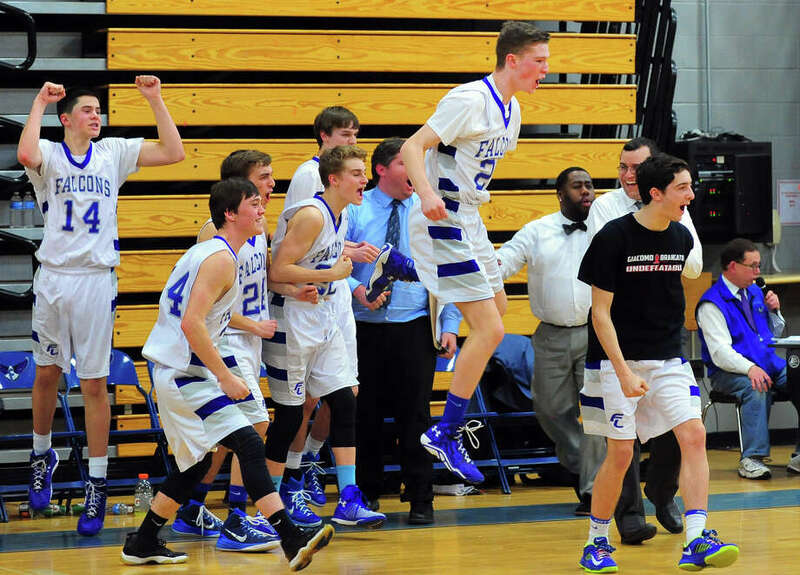 Fairfield Ludlowe team members leap of the bench after defeating Hamden, during Class LL Second Round of boys basketball action in Fairfield, Conn. on Wednesday Mar. 11, 2015. FAIRFIELD -- Let the hype begin. By advancing to the Class LL quarterfinals for the first time in program history, the Ludlowe boys basketball team set up a showdown with town rival Fairfield Prep on Friday night at Alumni Hall. The No. 8 Falcons accomplished the feat with a 50-45 win over No 9 Hamden on Wednesday, a game that they led from nearly the opening tip to the final buzzer. The Falcons have hung with the top teams in the FCIAC all season and are doing so with the best in the state. They will have another chance to notch a program-defining win against the top-seeded Jesuits, finalists in three of the last four years. "It's going to be something we will remember forever," Ludlowe coach John Dailey said. "We are going to go and try to win the game. We played them real tough at Christmas (a 71-63 loss); we felt if we made some free throws we would have had a shot to win the game." Ludlowe had to first survive a wild finish, though, as the Green Dragons had the ball trailing 47-45 with 44 seconds remaining. Senior Matt Doyle, who paced Ludlowe with 18 points, came up with a steal on that possession and hit a foul shot to push the lead to three. "Matt was clutch; after he missed that second one to go up four points I was (nervous)," Dailey said. "But we just got stops, we were trying to give a foul, but the pressure actually turned them over twice. This is a huge win; this is unbelievable for our program." The Green Dragons had one last chance, needing a 3-pointer to tie, but they committed a turnover and Doyle hit another free throw with nine seconds remaining to ice the game. Hamden nearly erased a six-point deficit in the final three minutes, but made crucial errors at the wrong times when given the chance to draw even. "I think both teams gave each other a chance to win the game," Hamden coach Jarrad Beck said. "We just didn't capitalize on it ¦ I'm just disappointed for the kids; this is a tough one." Ludlowe built a 34-22 lead midway through the second quarter behind its 2-3 zone that's been its bread and butter. Hamden had trouble finishing at the rim as a result and had to dig itself out of the hole. "We just stuck with the zone," Dailey said. "We were ready to go man but the zone was effective. I'm speechless; I'm just so happy for my kids. We just got quality looks and stops." The Green Dragons began to rally in the third quarter and closed the period on a 10-1 run to pull to within 37-34. The lead would remain no more than six for the entire fourth, but Ludlowe's defense held and made a number of stops down the stretch. Dylan Noble led Hamden with 23 points. The Falcons did reach the Division III final in 2005 -- their first year as a school. Blair Johnson 1 2-4 5 Dylan Noble 9 4-6 23 Christian Scott 2 0-0 4 CJ Seaforth 1 1-2 4 Andrew Rice 1 0-0 2 Oliver Graitam 2 0-0 4 Mike Servetas 0 2-2 2 Bryan Kearny 0 1-2 1. Totals: 16 10-19 45. Owen Mockler 4 1-2 9 Matt Doyle 5 8-10 18 Darren Lee 4 0-0 8 Cole Prowitt-Smith 1 1-1 3 Chad Peterson 2 2-5 6 Hayes Kelchner 2 1-1 6. Totals 17 13-20 50. 3-pointers: H--Noble, Seaforth, Johnson; L--Kelchner.